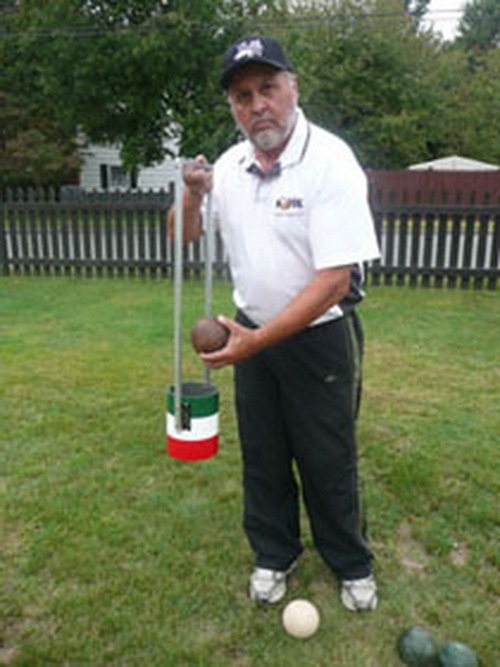 Bocce aficionado Michael Delucchi is bringing a great new product to market. 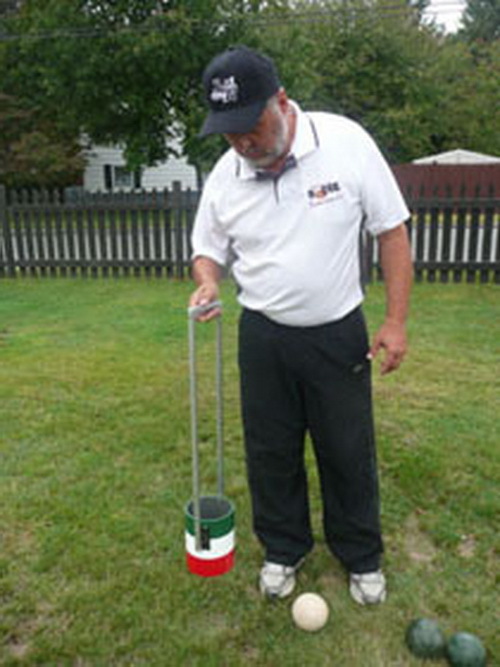 The Bocce Caddy can help those of us with bad backs to effortlessly pick up bocce balls. Lightweight yet durable, it can pick up two bocce balls at once. That’s me in my yard trying out the Bocce Caddy. Sorry I couldn’t get a better looking model on short notice. From left to right the balls are largest to smallest. Although designed for the international standard 107 mm balls, I wanted to see if the device could work for various sized bocce. I could tell pretty quickly that Delucchi hit a home run with this ingenious product. I like the idea that it is designed for 107 mm international standard balls. We should all be promoting that standard anyway. The fact that it picked up larger and smaller balls is a bonus. (The small yellow ball in the photo is 100 mm and it had no trouble with that size either). The slight interference during pick up (metal to plastic) may scar the bocce ball. Forcing the spring clips to a full closed position may hamper the reliability of a full spring return to the open position once the ball passes. The outer most component during ball pick-up is the adjusting screw. Impact on the adjusting screw may jar and compromise the integrity of its lock tight thread seal. Nonetheless, this lightweight, durable, attractively finished device fills a need in the bocce community. Let’s get this on the market ASAP. I’m on board as a product representative and will be seeking out others to help get the word out about this excellent and useful device. Click below to order. Fairly priced at $98.00 which includes shipping for United States Residents only. 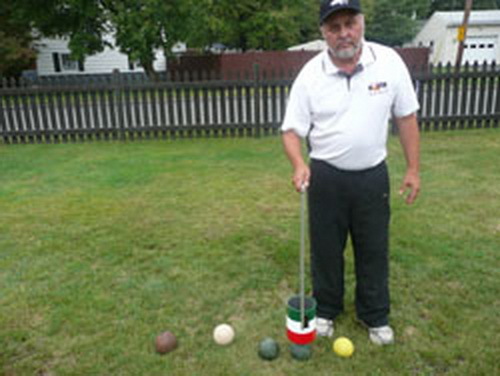 This entry was posted in products and tagged for those with bad backs, lift heavy balls effortlessly, lifting device, lightweight bocce lifter, Michael Delucchi, the bocce caddy, useful device for bocce. Bookmark the permalink.